Hi loves! How are you doing this Tuesday? I am just fine! The construction work is done at our house and now we have a huge attic because they placed a dormer (is that the correct translation for "dakkapel"? I am not sure haha). Today I am showing you a polish combo I did not made up myself - it was copied from this gorgeous manicure by the lovely AmyGrace. I do not own the basecolor she used so instead I picked my all time favorite dusty green which is OPI Thanks A Windmillion. I keep reaching for this shade over and over again ♥. The tips i just polished with a england She Walks In Beauty. First I dabbed some glitters on the tips, cleaned the brush by wiping it on the inside of the bottle neck and gently polish down the varnish I had on the tips. I loved this combo so much! Hope you like it too! And, don't forget to enter our 500.000 pageview giveaway! If you already entered, please check again because I forgot something important: I never asked for your e-mail address! Please be sure to check the widget and leave it in case you entered earlier! That's the way I love She Walks in Beauty...sponged like this. It's simply amazing!!!! This is beautiful! The glitter adds something special. What a lovely combo! She Walks In Beauty still is on my wishlist. What a lovely combo! Wouldn't have thought to put these two colors together! Then again, I'm not very creative, lol. I remember seeing that manicure from Amygrace and she walks in beauty looks gorgeous! Need to get myself thanks a windmillion as well to see why people like it. I just love the color combination, it's so pretty! Lovely. 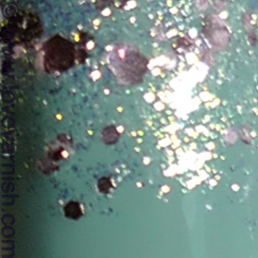 :) I didn't like this one when I first saw it, but as glitter tips it looks great, especially with that dusky teal! Wow! Congratulations! :-) That's a lot of pagewiews! Beautiful polish combo! It looks so good worn like this! I don't think I'll ever wear it another way :). Thanks so much! And yes, muted green will do the trick! Thank you Sabine! I am glad I grabbed it at a discount :). Thanks Angie! Well, me neither as I totally copied this manicure ;). Thank you Aglaya :). I think it'll work with other dusty shades too! Thanks Choi! It is seriously such a good shade, if you ever need a dusty green get Thanks a Windmillion ♥. Silva, you are very sharp ;-).